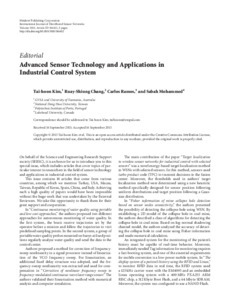 On behalf of the Science and Engineering Research Support society (SERSC), it is an honor for us to introduce you to this special issue, which includes articles that cover topics of particular interest to researchers in the field of sensor technology and applications in industrial control system. This issue contains 18 articles that come from various countries, among which we mention Turkey, USA, Macau, Taiwan, Republic of Korea, Spain, China, and Italy. Achieving such a high quality of papers would have been impossible without the huge work that was undertaken by the External Reviewers. We take this opportunity to thank them for their great support and cooperation.